We recently changed our menu to include an item which is made by infusing it with cacao husk. 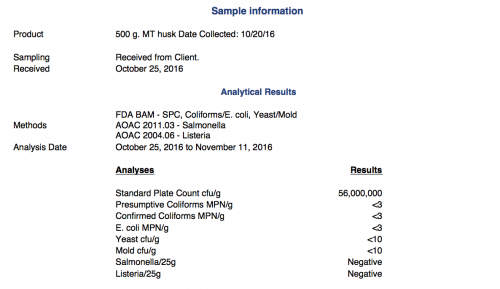 This led to a few questions, concerns, and some confusion, so it seemed like a good opportunity to talk husk in more detail, discuss our understanding of husk, and encourage a bit of caution toward the potential risk of using husk for food products. Let’s start at the beginning. 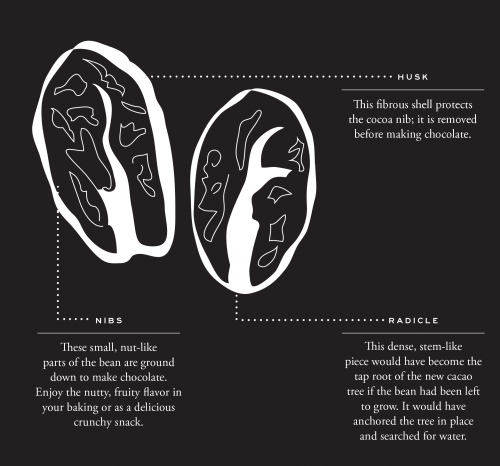 Cocoa beans have an outer coating, sometimes known as shell, husk, or seed coat, that, while composed of a few things, is primarily fiber. It’s actually pretty neat, it serves to protect the bean, or seed, until it germinates. When I say that the husk “protects” the seed, this includes absorbing many heavy metals that might be present in the environment and blocking fungi and other microorganisms from penetrating and destroying the bean. At the point of germination, a taproot pops through the husk, the bean pushes up out of the ground (buoyed by the taproot) and forms a cotyledon which nourishes the plant until it has formed enough leaf area to live and grow using photosynthesis. Sounds useful, right? If the husk isn’t cracked on a bean when it gets to you, you can feel relatively confident that the bean inside isn’t moldy as no spores can get in to grow mold. Yay! Three cheers for the husk! So, what’s the catch? Why don’t people use husk for all sorts of things? As you might imagine, heavy metal and microbiological contamination, which the husk prevent from reaching the nib, don’t just disappear, they stick with (and to) the husk. Sadly, it gets worse, when cocoa beans ferment and dry, fungi will sometimes grow on the husk and these fungi can produce mycotoxins (specifically alflatoxins and ochratoxins). You might guess from the name that mycotoxins are toxic to human beings and additionally, unlike most microorganisms, aren’t destroyed by heat. Lastly, if the beans aren’t dried and stored in a relatively secure area, chickens can run through them and flies can land on them which can contaminate beans with listeria, salmonella or E. Coli (among other things). So, as a chocolate maker, one of the first things we do is remove the husk from our cocoa beans. This is partly because of possible contamination and partly because it doesn’t refine well (after all, it’s mostly fiber!). Hence the winnowing step in our production process, it separates the husk from the nibs, giving us clean nibs to make into chocolate and leaving husk as byproduct. Boo! Three jeers for the husk! So, why add a panna cotta that has been infused with husk to our chef’s tasting menu? It is partly that the flavor from a husk infusion is different than a nib infusion, and we really liked the flavor. Also, our production process generates a fair amount of husk as a byproduct and we are always interested in doing better things with waste products than wasting them. While we typically give our husk to Bi-rite market’s farms to use as mulch, finding other uses is, well, useful. The controversial question is how do we know that we aren’t also putting all sorts of awful things into the panna cotta when we are giving it that husky flavor? Honestly, there is no way to be completely certain. When it comes to manufacturing with agricultural ingredients, it’s very difficult to know anything definitive about the state of their contamination as the contamination is typically in spots rather than completely saturating the product. This means that you need to understand the risk potential contamination presents and find ways to mitigate it although it is almost impossible to remove it completely. While we source our beans very carefully, we know that there is the possibility of contamination in our supply chain, so we test representative samples of beans and husk as we get them (meaning we pull small sample from a variety of areas). In this case, when we considered using husk to infuse flavor into cream, we tested for the most common contaminants to evaluate the risk and ensure that the husk panna cotta on our menu would be both safe and delicious. In comes Anresco labs, a local and experienced food lab that can test for almost everything. If you are looking to use husk, it’s worth understanding what to test for and why. The tests above illustrate our current approach and show the results on the husk that we use to give our panna cotta its flavor. 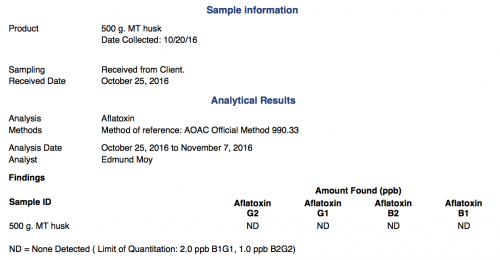 Aflatoxin (B1, B2, G1, G2) are mycotoxins and the results were negative, as were the results for microbiological contamination. SPC (or Standard Plate Count) looks high but doesn’t imply any actual health risks. A high SPC is simply indicative of microbiological activity, which is very common when it comes to cocoa beans—after all, the first step in cocoa processing is fermentation! SPC is also a valuable indicator for understanding sanitary conditions of the environment in which the beans were produced. 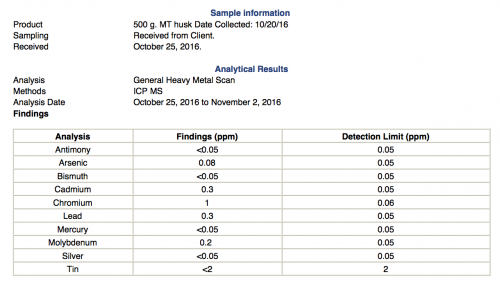 The only positive test results on the husk were for heavy metals. We analyzed these results based on the worst case scenario of everything present in the husk transferring directly and completely to the panna cotta. Since we aren’t feeding actual husk to anyone, this is almost certainly not going to happen; however, we wanted to ensure that even if all of the heavy metals were transferred, the panna cotta would be safe to consume. Below is a chart of the potential heavy metal content per serving of panna cotta. We arrived at these numbers by accounting for how much husk is used in the recipe and how many servings the recipe yields (we used 200g of husk in the recipe and it produces 40 servings). We also checked how the results line up with Prop 65, a California law which outlines daily limits for consumption of heavy metals and is the strictest regulation that limits heavy metal exposure that we know of). Again, this analysis was done as if we didn’t strain out the husk and/or if the metals completely infused into the panna cotta, which they almost certainly didn’t, have I clarified that too much? As you can see, considering the strictest guidelines, the panna cotta infused with husk should be safe to consume. Even so, this is a specific situation where we are using husk once we have done the due diligence to understand the risk associated with this specific origin and this specific harvest. Hopefully this explanation was helpful. Overall we don’t encourage people to blindly use or eat husk. It could be dangerous (think of it akin to eating raw chicken). That being said, the risk associated with using husk is quantifiable and assessable. If you are thinking of using husk, it’s important to do the homework, get some testing done, and send us your results so we have more data to analyze!